A popular technical chart pattern is the golden cross. This happens when the faster moving 50-day moving average (MA) crosses above the slower moving 200-day MA. The consensus is that a golden cross is a bullish development, as the name would suggest. The flip side is when the 50-day MA crosses beneath the 200-day MA, which is known as a death cross. Not surprisingly, this is viewed by market participants as a bearish omen. We bring this up today because the Dow is very close to completing a golden cross. With the first close above 18,000 since July 2015, we are seeing definite improvement for the 120-year old index. Now, here’s the bad news: The last time the Dow had a golden cross was December 23, 2015—and it dropped nearly 10% over the next month. This raises the question, is a golden cross really a good sign? 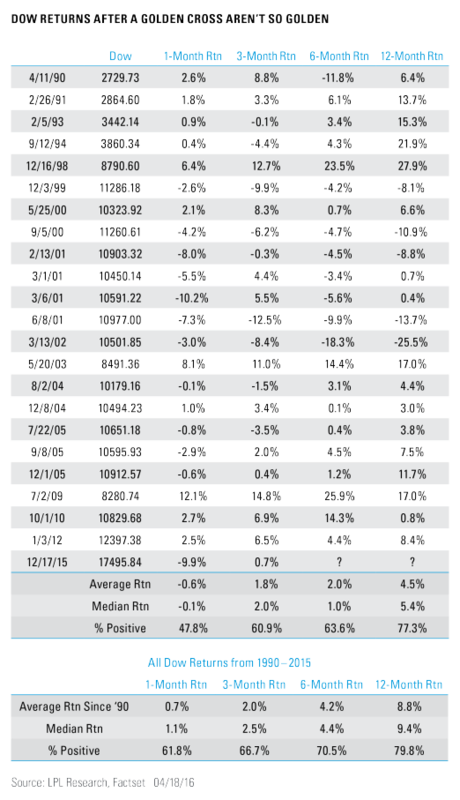 Since 1990, there have been 23 golden crosses for the Dow, and the return 1 month later is actually -0.6%, while the returns 3, 6, and 12 months later are all weaker than average as well. We will hear a lot about how bullish the pending Dow golden cross is after it happens. However, the historical evidence would suggest this isn’t the positive sign it appears to be. 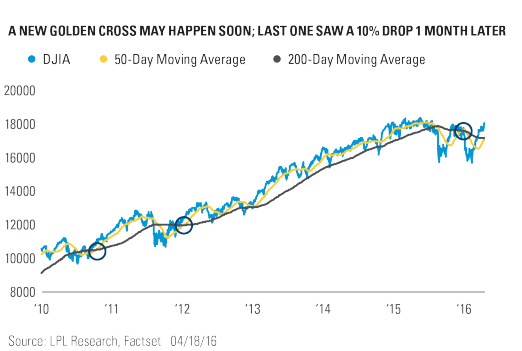 As we noted in this week’s Weekly Market Commentary, “Taking Stock After the Rally,” we still expect mid-single-digit gains for stocks in 2016,* but there are still several risks preventing us from becoming more aggressive. We expect modest gains (with a good deal of potential volatility) for the rest of this year, which would be in-line with a Dow golden cross.